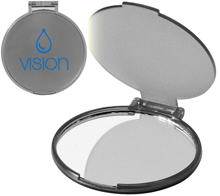 These Company Branded Glamour Cosmetic Mirrors are absolutely genius advertising and they make a big impact on your advertising. Perfect for the cosmetic industry, this is a promotional gift to place your bets on as it's a sure winner. They are suitable as freebies and their 4 colour choice with a single colour print provides good visual retention of your company brand-name and logo. Hand out a batch today and continue as normal with your marketing campaign - but be sure to reward yourself because you would have made a wise step in advertising today. Whether you are in the cosmetic industry or you perhaps run a hair salon? .. What a great promotional idea that will last a long time and provide consistent advertising so the customer will remember your name. Don't worry about this part - just provide us the artwork and we'll do the rest. We've branded thousands of promotional items and we're experts at it!